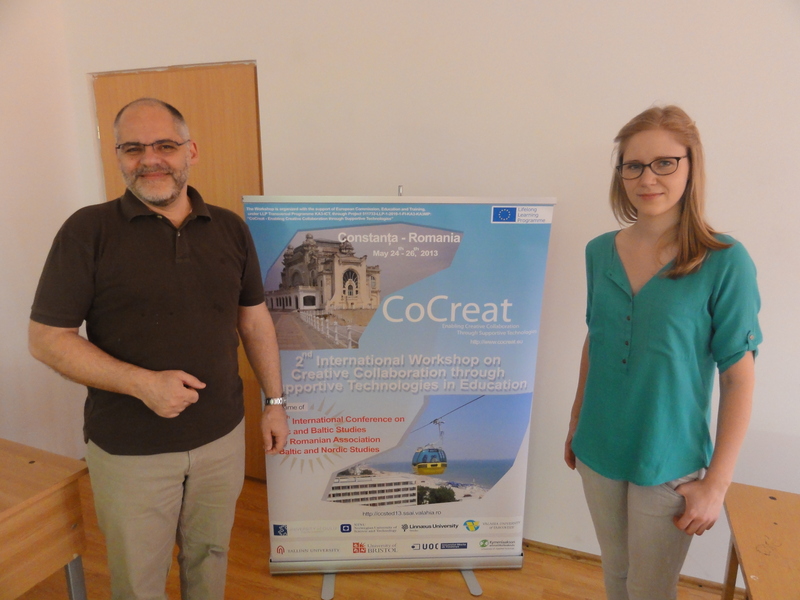 Second International Workshop on Creative Collaboration through Supportive Technologies in Education – CCSTED 2013 will be organized in Constanta, in May 24-26 in connection with The Fourth International Conference on Nordic and Baltic Studies of the Romanian Association for Baltic and Nordic Studies. For more information, visit the workshop webpage: http://ccsted13.ssai.valahia.ro/. After more than one year, the wonderful resort of Sinaia hosted again a CoCreat Project event. This time, beside a dedicated afternoon session of the Project trans-national coordinating meeting, the main event was the Dissemination Seminar, organized as a specific Workshop – 1st International Workshop on Creative Collaboration through Supportive Technologies in Education – CCSTED 2012 – in the frame of the 11th International Conference on Web-based Learning – ICWL 2012, a remarkable annual conference which reached in the past various locations from 3 continents (Asia, Australia and Europe). The number of participants was impressive: 70 researchers, specialists and university teaching staff from 35 countries attended the Conference and the related Workshops. The general topic of the CCSTED Workshop was oriented on how to support creative collaboration through various technologies, at different levels of education: pre-primary, primary, secondary, university and adult education. The workshop concentrated around current research on computer supported collaborative learning topics leading towards the meaning of a learning environment which can support creative collaboration process. 10 papers were presented at the workshop, most of them emphasizing on the experience and results obtained in the CoCreat Project. The main paper subjects were oriented on the illustration and evaluation of the collaborative spaces which has been achieved in the project. In the end of the workshop, a Panel related to Technology in Support of Collaborative Learning – Challenges and Perspectives was held, as a concluding moment for the discussions revealed during the presentations. The workshop audience heard presentations from eight speakers from countries across Europe on the ways in which collaboration during creative projects had been facilitated on-line and the challenges involved. Having in view that the most of the presentations came from the LLP CoCreat project participants, the initial results clearly indicate the need to prepare carefully for creative collaboration. Students need first to be confident both in their ability to communicate with each other and to use the technologies involved so that they can share their ideas and build a common understanding of the creative task. When students are confident in using the software, and have the time to experiment, having both construction tasks and visualizations such as in 3D Virtual Worlds, appear to help support collaborative creativity. As main organizers of this Workshop, the CoCreat team from Valahia University Targoviste would like to thank for the whole support, to the participants, to the steering committee of the CoCreat project, but also to the ICWL 2012 Conference organizers, mentioning that there is an important expectation that the Workshop will be organized as a second edition in 2013. CoCreat’s 1st collaborative space will be presented at Online Educa Berlin on this Friday 2nd of December at the “Social Media: An Opportunity to Collaborate (MED47)” -session starting at 11:45. If you are at OEB, be there! Future School Research Center’s seminar was centered around issues related to innovative pedagogical practises and research, possibilities of ICT in learning and high-quality research data connected with future learning. CoCreat attended the seminar by presenting our project in the poster session. For more information about the seminar, please visit the seminar website and for more information about FSR, go here. Venla from our LET team at the poster session.